On 19th of June together with my wife we were heading to a city break holiday. On holidays I have more time to read and I usually bring a book or my kindle with me. I've picked the book Deadline and started reading it on the flight. It is a great novel about software project management. I managed to finish reading it and even start a new novel about team building in those 3-4 days. I've loved reading and decided that is time to read more. 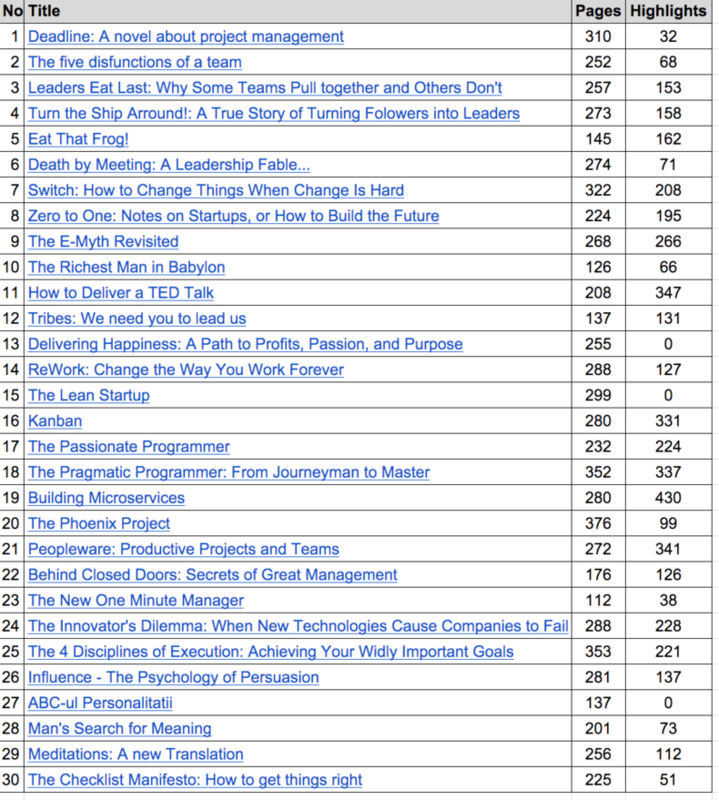 I've decided to read technical and personal development books. Why I wanted to read more? improving my strengths and weaknesses - One of my aim is continuous improvement. This is why I've started taking some online tests and asking colleagues for feedback. I considered it a good way of identifying my strengths and weaknesses. improving my English - English is not my native language and I wanted to get better. I wanted to get to the point were I'm able to think in English when speaking. Without the need to translate first from Romanian. I also wanted to extend my vocabulary. "Go to bed smarter than when you woke up." - Charlie Munger. That is a great advice and I thought the best way to do it is by reading more. From the 30 books I've read: 27 were ebooks, 2 were hardcovers and one was an audiobook. make a habit from reading daily - I've started to wake up with 30 min earlier in order to read. I've reduced time spent on TV and computer. I've even tried to read while waiting in lines. if you are set on reading more it is helpful if your partner shares a similar goal. better time management - make daily and weekly plans with clear time windows for reading. set a clear reading challenge - people with goals clearly specified and written have more chances to complete them. define intermediate goals for your bigger goal - having intermediate goals helps your motivation because they provide satisfaction once you achieve them. It also tells you if you are on track. track your progress and make predictions on how much will you be able to read if you continue on the same rhythm - I've used a simple google sheet as in the table displayed above. 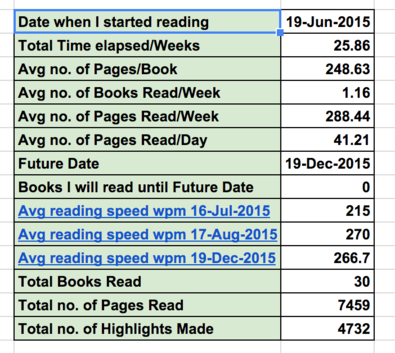 I've tracked: how many books I've read, average number of pages and books read per week and day. I made predictions on how many books I will be able to read to a future date if I will continue in the same rhythm. I could easily see if I was moving too slow or if I was ahead for my deadline. It helped a lot with my motivation. try different reading alternatives and see what works best for you: try hardcopies, audiobooks and ebooks. There are studies that show that people who use e-readers read on average more compared to the rest. For me e-reader was the best solution, mainly because I wanted to read in English and I prefer to be able to easily do highlights and review them afterwards. It also allowed me to have the content of books available on multiple devices: e-reader, phone, laptop. share your goal with your friends - you will make a commitment in front of them and it will be harder to fail. This is not you showing off in front of them, is just using the commitment as a motivator for you. use goodreads to set the challenge and share progress with friends.It also allows to easily find books, lists and keep an evidence of what you read and write your own reviews. identify your preferred style of writing - there are different styles a book can be written. Find the ones which work for you and pick books accordingly. There are different styles: novels, theories, statements backed up with studies examples, personal experience and many others. read one book at a time and search for next book when you finished it or when you are close to finish it - I've loved searching for the next book. I've developed different techniques on how to best pick the next book. I'm currently using a combination of: amazon, goodreads average rating, number of reviews, most positive review, most negative review, recommendations from reading/books blogs I've follow, recommendations from friends and public figures. follow blogs about books and reading - you find out about new books to add to your wishlist and also valuable articles. create and grow your own reading circle - find out who from your friends are already reading and start discussing about books. Suggest to people to read and give them books as presents. Share inside your circle what you are reading, thoughts, discuss about books, motivate each other to read more. convince your colleagues and managers to read technical and personal development books daily at work - you could start with 15 minutes of reading and 10 minutes of sharing between yourselves what you've read. There are already some companies which are already doing it and with great benefits for both the employees and the company. increasing your knowledge in a domain by reading books in that domain. having the opportunity to learn from other people experiences. If I would be asked what would be only one suggestion I would give to somebody that would be: to read more. It can change your life, it can change you. if you read one book per week, 50 books per year, that will make you one of the best educated, smartest, most capable and highest paid people in your field. Regular reading will transform your life completely. average reader can read in ~3.5-4 hours ~65000 words. use amazon wishlist for next books and highlights if you have a kindle. use a speed reader test - I've increased my reading speed in 3 months from ~210wpm to ~270wpm. I've started measuring it after the first 5 books.